Discussion in 'Reviews and Articles' started by Lord Kain, Aug 27, 2008. Today we're testing an item coming out at the end of its life cycle: a DVD player. We test the player’s features and determine how it manages to play various media in our tests. Here’s a link from Samsung’s website for more details on the features and specifications. That player boasts some slick looks! (A good start from the unpackaging part of the review process.) Having nothing more to say about the front panel, I moved my attention to the backside of the unit, to see what kind of jacks and connectors were available. I found an HDMI port, video component jacks, a coaxial audio jack plus an optical audio port (for the Dolby Digital audio) and the usual RCA connectors. I first connected the player through component cables to see the base quality of DVD playback. The unit offers excellent picture quality and contrast for its price range. The test was conducted on a Samsung HD 42” plasma flat panel. After this, I quickly swapped the component cables for HDMI, to test the rest of the features. To activate the upscaling function, you only have to press one key on the remote. The upscaling quality appeared excellent. I tested the player with five different movies and no artifacts or unwanted lines appeared during playback. Bottom line, the player serves its purpose well. When I was done with regular DVD movies, I decided to see how the player performs with various file formats that I previously burned on a DVD+Rs and DVD+RWs. Personally, I mainly use my home player to view DivX files, so that part of the review was especially important for me. I haven’t seen anything wrong with my MP3 or DivX files playback: the quality was excellent. Nevertheless, I stumbled upon one of the most worst interface-based problems I ever experienced on such a device. With this player, you must name all your files in a very parsimonious way, because it doesn’t want to share many explanations on what it will read. The file names are displayed in a box taking the higher left corner of the screen. If a file name length exceeds this box... you’re out of luck: you just can’t read it! What do you think happened to me? All of my files were tagged the same, with the name of the series, season and then the title and number of the episode. The box was only able to show the title of the series, nothing more. Why not allow some kind of scrolling? On my LG player, the interface uses the whole screen width, so this is not a problem. On one of my Sony players, which have a smaller viewing range, the text automatically scrolls. Congratulations to Samsung for such an annoying bug: I had to randomly select files until I stumbled upon the intended one. If it can’t be solved with some kind of firmware update, I strongly hope that this will be corrected in further iterations of the player. Or maybe I’m just plain dumb and I didn’t find how to scroll my text, but I also didn’t find anything about a scrolling functions in the product’s documentation. On the topic of the interface, at least the menus are well organized. It is quite easy to find what you’re looking for. The main problem is that the commands are irresponsive. It takes some time to react when you press a button, which is annoying. In my humble opinion, modern quality devices shouldn’t have that kind of issues. The DVD-1080P8 is an interesting choice if you’re looking for a versatile DVD player, before jumping in the Blu-Ray bandwagon. Just don’t bother with it if the main reason for buying a player is DivX playback, as other players perform much better on that topic. Bottom line, I'd give the DVD-1080P8 a score of 3/5. Forget the interface problems (you use short filenames) and I'd boost the score to 4/5. 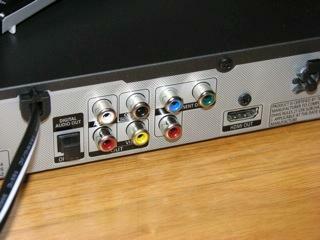 Does this unit support the BD 1.1 disc features, such as picture-in-picture commentaries? Version 2.0 will have some web capabilities too, so to me the PS3 is still the best value.